TOTAL QUANTITY: 11 BLACK AND WHITE NYLON PRISONER PANT SET. LONG SLEEVE, V-NECK COLLAR TOP HAS RED NUMBERS ON BACK. HAT INCLUDED. THIS SET IS ORDERED BY THE TOP SIZE, PANTS WILL BE MATCHED AS CLOSELY AS POSSIBLE. TOTAL QUANTITY: 11 FUN BLACK AND RED LACE DRESS WITH SEQUIN ACCENTS. WOULD BE GREAT FOR A SPANISH ROUTINE AND PAIRS WELL WITH OUR BULL FIGHTER UNITARD (ROW53). DRESS HAS GREAT LACE SLEEVES, LACE PETTICOAT LAYERS, AND A BUILT-IN LEOTARD. MADE BY CREATIONS BY CICCI. TOTAL QUANTITY: 15 ADORABLE BODY SUITS IN DIFFERENT ANIMAL PRINTS, COLORS, AND STYLES WITH MATCHING TUTUS. WHEN SELECTING THE COSTUME, PLEASE SPECIFY THE PRINT. THE MODELS ARE WEARING A SIZE MEDIUM. TOTAL QUANTITY: 5 FULLY FUN APE COSTUME! 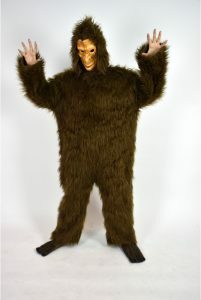 FULLY FUZZY /HAIRY APE COSTUME THAT ZIPS UP THE BACK AND HAS A MASK AND FEET INCLUDED. THE MODEL IS WEARING A SIZE ONE SIZE FITS MOST. ITEM NUMBER: WHHS97-S TOTAL QUANTITY: 7 THIS FEMININE ARMY COSTUME INCLUDES THE ZIP FRONT SHIRT WITH ATTACHED SPLIT-FRONT SKIRT AND "ARMY BRAT" PATCH ON FRONT POCKET. BELT AND HAT ARE ALSO INCLUDED; HOWEVER, DANCE SHORTS AND BLACK BRA TOP ARE NOT. DESIGNED BY "BE WICKED". OUR MODEL IS WEARING A SMALL/MEDIUM. 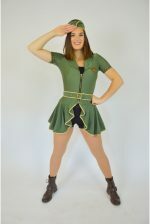 TOTAL QUANTITY: 6 THIS ADORABLE MILITARY DRESS BY DREAM GIRL, FEATURES AN OLIVE OR ARMY GREEN LYCRA DRESS WITH CAP SLEEVES AND A V CUT NECK. THE DRESS ZIPS UP IN THE BACK AND HAS A PATCH AND YELLOW STRIPES ON THE FRONT WITH AN ATTACHED SKIRT WITH LAYERS OF BLACK TULLE UNDERNEATH. THE HAT HAS A MATCHING PATCH ON THE FRONT AND BRIEFS WILL BE NEEDED FOR COVERAGE. THE MODEL IS WEARING A SIZE SMALL. TOTAL QUANTITY: 7 THIS BABY BLUE POLKA DOT DRESS IS ADORABLE AND MADE BY FORUM NOVELTIES INC. IT IS BABY BLUE WITH WHITE POLKA DOTS WITH A 50'S FLARE TO IT. POLYESTER WITH NO STRETCH THAT ZIPS UP THE BACK. THERE IS ELASTIC AT THE WAIST AND IT IS HALTER STYLE. THE SKIRT FALLS 27" FROM THE WAIST. THERE IS A WHITE PETTICOAT UNDERNEATH, BUT NOT ATTACHED AND A BELT AS WELL. THE MODEL IS WEARING A MEDIUM/LARGE. TOTAL QUANTITY: 16 DRESS HAS WHITE BASEBALL SLEEVES, WHITE BELT, AND RUFFLE HEM. INCLUDES BASEBALL SOCKS. CREATED BY UNIS. TOTAL QUANTITY: 15 ADORABLE BLACK LYRCRA BATMAN BIKETARD THAT ZIPS UP IN THE BACK WITH A 4" INSEAM. BY TEAM GO FIGURE THIS SUPER HERO LOOK IS FIERCE! THE BIKETARD OFFERS LONG SLEEVES THAT CREATE WINGS WITH YELLOW ACCENT ALONG THE WINGS. THERE IS A BATMAN SYMBOL ON THE CHEST IN YELLOW AND A YELLOW BELT AT THE WAIST. THE MASK IS NOT INCLUDED. THE MODEL IS WEARING A SIZE MEDIUM. 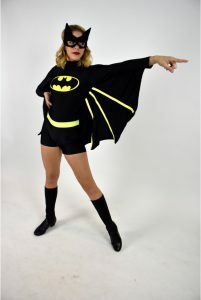 TOTAL QUANTITY: 20 BLACK LYCRA ONE SLEEVE LEOTARD WITH ONE LONG SLEEVE AND GOLD BATMAN SYMBOL ON THE FRONT. GOLD METALLIC SHORTS TO GO WITH. BY BALERA. MASK NOT INCLUDED. TOTAL QUANTITY: 4 BEAUTIFUL BLACK VELOUR LEOTARD WITH GOLD METALLIC COLLAR AND GOLD SEQUIN BUTTONS DOWN THE FRONT. THE COLLAR CLOSES WITH A CLASP IN A HALTER STYLE, AND THERE ARE GOLD METALLIC TAILS THAT ARE ATTACHED TO THE BACK. A GOLD METALLIC GATHERED BOW IS PINNED ON THE BACK AND CAN BE REMOVED. THERE ARE MATCHING VELOUR AND GOLD SEQUIN GLOVES. T HE MODEL IS WEARING A SIZE MEDIUM. TOTAL QUANTITY: 30 ADORABLE BLACK AND RED CHECKERS TUNIC SET. THESE TOPS COME IN BLACK OR RED LYCRA WITH THE OPPOSITE COLOR OF CROWN ON THE CHEST. THESE ARE BOTH LONG SLEEVE AND ZIP UP THE BACK. THESE ARE GREAT FOR ANY MILITARY ROUTINE! THE TUNICS DROP 21" FROM THE ARM PIT. BY TEAM GO FIGURE. THE MODELS ARE WEARING SIZE SMALLS. TOTAL QUANTITY: 18 BLACK LACE DRESS WITH RED LINING AND BUILT-IN LEOTARD THAT TIES AROUND THE NECK. LARGE TEAM SET. CREATED BY KELLE. TOTAL QUANTITY: 23 VERY CUTE BLACK AND RED LYCRA STRETCH DRESS WITH A STAND UP COLLAR JUST LIKE A VAMPIRE OR DRACULA. THE NECK HAS A SNAP CLOSURE AND A SYMMETRICAL OPENING AT THE NECK AND BACK WITH RED PIPING THAT GOES DOWN INTO A CORSET DESIGN ON BOTH SIDES. THE SLEEVES ARE BLACK WITH A FINGER HOLE AND HAVE FABRIC TO MAKE THE SLEEVES WINGED WHEN THE ARMS ARE OPEN. ATTACHED IS A RED AND BLACK SKIRT WITH RED BIKE SHORTS THAT HAVE A 1" INSEAM. THE SKIRT DROPS TO 11". THE MODEL IS WEARING A SIZE SMALL. BY TEAM GO FIGURE. TOTAL QUANTITY: 10 SOLD AS A SET, PRICE DOES NOT CHANGE IF SPLIT. WHITE RUFFLE CROPPED TOP WITH BLACK AND WHITE STRIPED SKIRT, CORSET BELT AND MATCHING HEADBAND. SPATS NOT INCLUDED. MADE BY YANDY. ITNUMBER: WHHS96-S TOTAL QUANTITY: 6 DIZZY PATTERN OF BLACK AND WHITE CIRCLES AND BELL SLEEVES MAKES THIS THE PERFECT GOGO DRESS FOR A 60'S NUMBER. DESIGNED BY UNIS. ITEM NUMBER: LHHS307-S TOTAL QUANTITY: 47 MAKE THE CALL IN THIS BLACK AND WHITE STRIPED TANK TOP BY "IN YOUR FACE" APPAREL. TOTAL QUANTITY: 17 SHORT SLEEVE ZIP UP JUMPSUIT WITH A COLLAR, BELT LOOPS, AND TWO POCKETS ON BOTTOM. 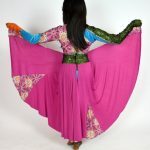 THIS COSTUME SHOWS SOME WEAR MADE BY URBAN GROOVE. TOTAL QUANTITY: 6 CUTE "GREASE" INSPIRED PLEATHER "T-BIRD" JACKET. THIS A FULLY ZIP UP JACKET THAT READS "FIFTIES THUNDER BIRD" IN MATTE SILVER ON THE BACK. THE MODEL IS WEARING A SIZE MEDIUM. TOTAL QUANTITY: 26 BLACK VELOUR CROSSING CHOKER UNITARD. LONG SLEEVES, CROSSING AROUND NECK AND MESH STOMACH. RHINESTONES AROUND NECK AND STOMACH. MADE BY LEAPIN LEOTARDS. TOTAL QUANTITY: 15 BLACK VELVET TUX JACKET WITH SATIN COLLAR AND WAIST WITH ONE SILVER BUTTON. HAT NOT INCLUDED. MADE BY SPARKLE. TOTAL QUANTITY: 68 ADORABLE DRESS BY LEAPIN LEOTARDS MADE OF BLACK, RED AND WHITE LYCRA MATERIAL. THE TOP OF THE DRESS IS WHITE WITH LONG SLEEVES THAT GOES INTO A BLACK CORSET BELT IN THE WAIST AREA WITH A RED SKIRT. THE SKIRT DROPS 13" FROM THE WAIST. THE MODEL IS WEARING A SIZE SMALL. YOU WILL NEED BRIEFS UNDER FOR COVERAGE. TOTAL QUANTITY: 14 AQUA BLUE AND BLACK BIKETARD. TOP IS DETAILED WITH AQUA BLUE SPARKLE POLKA DOTS, BELT AND COLLAR. BOTTOM HAS BLACK LAYERED FRINGE ATTACHED. OPEN BACK, CLASP BUTTON ON NECK. ZIPPER UP FRONT. 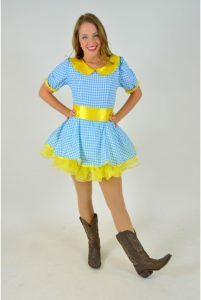 TOTAL QUANTITY: 10 BLUE AND WHITE CHECKERED DRESS WITH CAP SLEEVES AND A YELLOW PETTICOAT. COLLAR AND RIBBON AROUND THE WAIST. BY ART STONE. ITEM NUMBER: LHHS291-S TOTAL QUANTITY: 12 THIS LIGHT BLUE COLONIAL DRESS IS PERFECT FOR A "HAMILTON" PRODUCTION. IT IS BUILT ON A LEOTARD AND HAS ATTACHED PETTICOAT. THE BLUE VELVET BODICE HAS GOLD BUTTONS, PUFF SLEEVES, AND LACE DETAILS OF THE PERIOD. IT IS DESIGNED BY WEISSMAN. TOTAL QUANTITY: 15 HALTER WITH SHIMMER SHINE. WHITE DOTS. ASYMMETRICAL CUT. MATCHING TRUNKS INCLUDED. CREATED BY GEORGIE GIRL. ITEM NUMBER: LHHS340-S TOTAL QUANTITY: 16 THIS SHINY SHORT JACKET WAS A BELT TIE AND RHINESTONE BUTTON DETAIL. IT HAS VELCRO CLOSURE AND IS MADE BY BP DESIGNS. TOTAL QUANTITY: 35 DARK BLUE VELOUR LONG-SLEEVE TOP WITH SHEER SLEEVES, NECKLINE AND UPPER STOMACH, RHINESTONE ACCENTS AND MATCHING CAPRI PANTS MADE BY GEORGIE GIRL. TOTAL QUANTITY: 42 CUTE AND FUN "GO GO" STYLE OF DRESS WITH RED METALLIC ACCENTS, AND ORANGE WATERCOLOR PANEL ACCENTS AS WELL. BY LEAPIN LEOTARDS, THIS DRESS FEATURES CAP SLEEVES A HIGH COLLAR WITH LAPELS AND IT ZIPS UP THE BACK OF THE NECK FOR CLOSURE. LYCRA STRETCH FABRIC WITH SLITS UP THE SIDES. NEEDS DANCE SHORTS FOR COVERAGE. THE MODEL IS WEAR A SIZE SMALL. 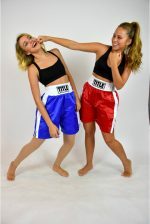 TOTAL QUANTITY: 37 COLORS AND SIZES AVAILABLE: BLUE: 13 SMALL, 3 MEDIUM, 3 LARGE RED: 2 YOUTH LARGE, 8 SMALL, 5 MEDIUM, 3 LARGE ELASTIC WAIST "TITLE BOXING" SHORTS. BRA TOP NOT INCLUDED. TOTAL QUANTITY: 8 ADORABLE BROWN VELOUR INDIAN SET BY TEAM GO FIGURE FEATURES A TOP AND SKIRT WITH FRINGE AND COLOR DETAIL. THE TOP TO THIS SET FEATURES A ONE SHOULDER DESIGN WITH FRINGE AND AN ANGLED HEM WITH A SIDE SLIT FRINGE AND A COLOR BAND ACROSS THE BOTTOM. THE SKIRT HAS AN ELASTIC WAIST THAT HAS AN 8" DROP AT IT'S HIGHEST POINT THAT ANGLES DOWN TO A LOWER POINT. THE BOTTOM HAS FRINGE AND MATCHING COLORED BAND. THE MODEL IS WEARING A SIZE MEDIUM. TOTAL QUANTITY: 11 LONG SLEEVED, BLACK VELOUR UNITARD WITH RED, WHITE, AND GOLD ACCENTS. HAS WHITE LACE RUFFLE DETAILING AT NECK. WOULD BE GREAT FOR A SPANISH ROUTINE AND PAIRS WELL WITH OUR SPANISH GIRL DRESS (ROW54). MADE BY ART STONE. COMES WITH A BLACK BULL FIGHTER HAT.